The Dolphin has long been symbolic of Christ. Among the earlier artistic impressions of it are those to be found in abundance on the walls of the Catacombs. The reason for the emphasis on this particular symbol is drawn from the experience and lives of the fishermen of the early church period. The fishermen saw in the dolphin the human qualities of love, affection, friendship and warnings of imminent danger. 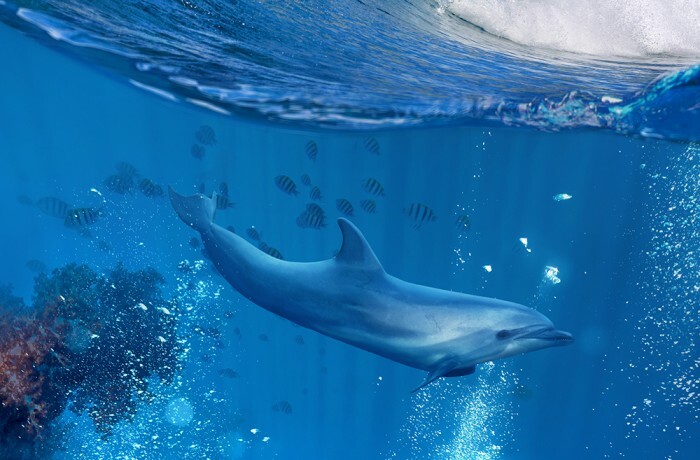 The dolphin was to be found only in the purest waters. Of incredible swiftness in its motion, it became the emblem of absolute strength because people believed that the only thing that could control it was the love it had for man. Its affection for man was said to be so great that it was very friendly to anyone who approached it with kindness. It would also recognise the fishermen individually and would follow them, frequently warning them of an oncoming storm by changing its playful ways and leading them in a straight motion toward port. The dolphin would thus rescue the fishermen from danger and lead them safely home. This led to the idea of the dolphin as light-bearer, representing Christ as light of the world and this image of it has been preserved in Christian art. He was recognised as a symbol of Christ, the Saviour friendly to man, and also to the Christians who gather confidently and joyously in the midst of the storm around the Saviour, the never extinguishing Light. The dolphin was sometimes drawn with a boat, at times intertwined with an anchor and at other times with an octopus. The dolphin drawn with the boat was a symbol of the Church or its people being protected and guided by Jesus. The anchor is a sign that the Christian is unmovable and firm in his faith and the dolphin, representing Christ on the cross protects us on our journey. The octopus with its tentacles everywhere is symbolic of Satan who has been conquered by Christ represented by the dolphin.